Metpar Corporation is located in Westbury, New York and it has been in business since 1952. In 2014, Metpar acquired Sanymetal Partitions and integrated the Sanymetal product line into their state of the art manufacturing. Metpar bathroom stalls are available in six different material choices and four different mounting styles. These options make the Metpar product line very flexible and easy to add into to virtually any restroom. Powder Coated Steel Toilet Partitions – These stalls use powder coated baked enamel to produce a durable, economical, and easy to clean surface. All doors come with a “in use” indicator latch. These partitions are available in Overhead Braced (Corinthian Style), Floor Mounted (Luxor Style), Floor Mounted (Eastern and Middle Eastern Style), and Ceiling Hung mounting (Forum Style). Stainless Steel Toilet Partitions – These panels provides durability, they’re easy to clean, and they are also resistant to humid conditions. They are available in leather grain and embossed pattern as well as multiple mounting options that include Overhead Braced (Corinthian Style), Floor Mounted (Luxor Style), Floor Mounted (Eastern and Middle Eastern Style), and Ceiling Hung mounting (Forum Style). Polly HDPE Toilet Partitions –These partitions are great for high volume and vandal-prone restrooms. They are constructed of 1” solid high density polyethylene plastic that is durable and strong, will never rust, and that is scratch, dent and graffiti resistant. They are available in 25 popular colors and they come with heavy gauge stainless steel shoes and full-length aluminum brackets. This material has color throughout the product and is available as bathroom stalls, shower stalls and urinal screens. This material includes a 15-year warranty and mounting options available in Overhead Braced (Corinthian Style), Floor Mounted (Luxor Style), Floor Mounted (Eastern and Middle Eastern Style), and Ceiling Hung mounting (Forum Style). High Pressure Laminate Toilet Partitions –This material required minimal amount of care and offers great durability. Panels are available in a variety of colors with options for wood grain textures, plywood core panels, and steel core pilasters if desired. Partitions are available in any color for several leading laminate manufacturers as well. Material is available for bathroom stalls and urinal screens which include Overhead Braced (Corinthian Style), Floor Mounted (Luxor Style), Floor Mounted (Eastern and Middle Eastern Style), and Ceiling Hung mounting (Forum Style). Solid Phenolic Toilet Partitions –This material is great for bathrooms that need full water contact and can be hosed down to clean. This material exceeds the fire protection association’s recommendation for smoke production and has a class B fire rating. A variety of colors and wood grain textures are available to match your décor. Door hardware has emergency outside access to stall. All hardware and fittings are stainless steel and the door hardware has emergency outside access to stall. This material has a 10 year warranty and is available for bathroom stalls, shower stalls and urinal screens and includes options in any color for several leading laminate manufacturers. Mounting options are flexible and include Overhead Braced (Corinthian Style), Floor Mounted (Luxor Style), Floor Mounted (Eastern and Middle Eastern Style), and Ceiling Hung mounting (Forum Style). Dur-A-Tex Partitions – This steel partition is highly durable and has a textured surface. It is exclusive to Metpar Partitions and has a two-coat paint process to increase durability while also giving it a unique upscale look. This material is resistant to graffiti and corrosion which is two times greater than a standard powder coated finish. The texture is patterned to help prevent damage and improve the strength. The nickel silver color is very close to the appearance of stainless steel and ½ the price. The high gloss coating makes it easier to remove permanent marker and spray paint from the surface, which reduces time on clean up. Aluminum privacy covers are available to match the color of this material for added privacy. This material has a 3 year warranty and some colors available as a 48 hour express ship item. As with the other materials, mounting optons are available in Overhead Braced (Corinthian Style), Floor Mounted (Luxor Style), Floor Mounted (Eastern and Middle Eastern Style), and Ceiling Hung mounting (Forum Style). 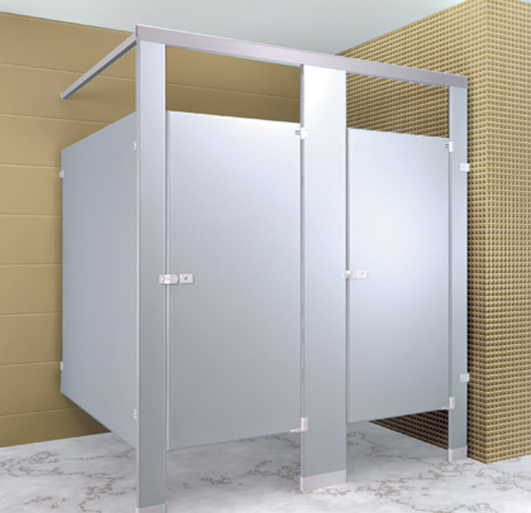 Metpar offers shower and dressing enclosures for all materials except plastic laminate. The shower stalls include heavy-duty curtains, curtain track, hooks and soap dish. Receptors are precast terrazzo with integral cast drain and removable stainless steel strainer. Dur-A-Tex material has a high gloss coating which allows permanent marker and spray paint to be removed without damaging the surface. Metpar Partition Bathroom Stalls are available in four different mounting choices and a wide variety of material choices and colors. Metpar and Sanymetal Partition Replacement parts and hardware are also readily available and in stock to ship quick. Metpar uses a concealed latch with in-use indicator and matching strike and keeper on their toilet partitions. It is now available exclusively in stainless steel finish. This latch is available for powder coated steel, stainless steel and dur-a-tex materials. Metpar products can help with your LEED credits on building projects that are LEED certified. Each Metpar Partition material carries LEED Credits based on the material properties. All materials contain recycled content. Metpar partitions ship out of Westbury New York, with a 1-2 week lead time based on color and material type chosen. Metpar express is available for select materials and colors that ship within 48 hours.